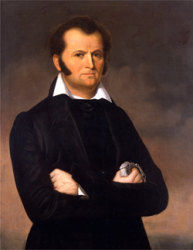 James "Jim" Bowie was born on 10 April 1796 in Logan County (present day Simpson County), KY, one of ten children of Rezin and Elve Bowie. About 1809 the Bowies moved to Louisiana where they established a plantation on the Vermilion River. In response to Andrew Jackson's plea for volunteers to fight the British in the War of 1812, James and Rezin enlisted in the Louisiana Militia in late 1814. The war ended on 24 December of that year with the signing of the Treaty of Ghent, and the Bowie brothers arrived in New Orleans too late to participate in the fighting. After mustering out of the militia, Bowie settled in Rapides Parish, where he supported himself by sawing planks and lumber and floating them down the bayou for sale. The brothers also traded illegally in slaves and dabbled in land speculation. In 1827, Jim Bowie was embroiled in the so-called Sandbar Fight which marked his first notable use of the heavy bladed knife that would be named for him; he gained a reputation as a formidable knife fighter. In 1829, Bowie became engaged to Cecelia Wells but she died two weeks before their wedding was to take place. By February 1830, Bowie was in Texas and took the oath of allegiance to Mexico. On 25 April 1831, Bowie married Ursula de Veramendi in San Antonio; a little more than two years later, Ursula, her parents, and her child died in a cholera epidemic and Bowie reportedly turned to the bottle. In 1835 Bowie was appointed a commissioner to promote settlement in Texas, but fled when Santa Ana abolished the Coahuila-Texas government and ordered the arrest of all Texans. Bowie joined with the so-called Texas War Party; in October Bowie, with ninety-two men, faced off with the Mexicans, who had three times the troops, in a battle that lasted three hours. Bowie captured a six-pounder cannon and thirty muskets and lost one man. The Mexicans suffered over thirty casualties. In November he asked to be relieved of his command. On 19 January 1836, Bowie arrived in Bexar with thirty men carrying orders from Sam Houston for the demolition of the fortifications there. On 2 February, Bowie wrote the Governor, urging that Bexar be held. William Travis arrived with thirty men on 3 February in order to take command of the forces quartered at the Alamo mission near Bexar. Bowie and Travis then worked out a compromise which gave Travis command of the regulars; Bowie command of the volunteers. On 24 February, Bowie collapsed and took to his bed. Speculation on his ailment favors typhoid pneumonia or tuberculosis. On 6 March, the Mexican forces attacked, and all the defenders of the Alamo died; Bowie was found on his cot in a room on the south side. He had been shot several times. James "Jim" Bowie was killed by Mexican Forces on 6 March 1836 at the Alamo. He is buried in the San Fernando Cathedral in San Antonio, TX.